Earlier this month, you met Abi, our work placement student, who helped out around the BPMA, getting a taste of what it’s like to work in a museum and archive. While she was here she did some research for us into greetings telegrams, which were introduced 80 years ago this month. 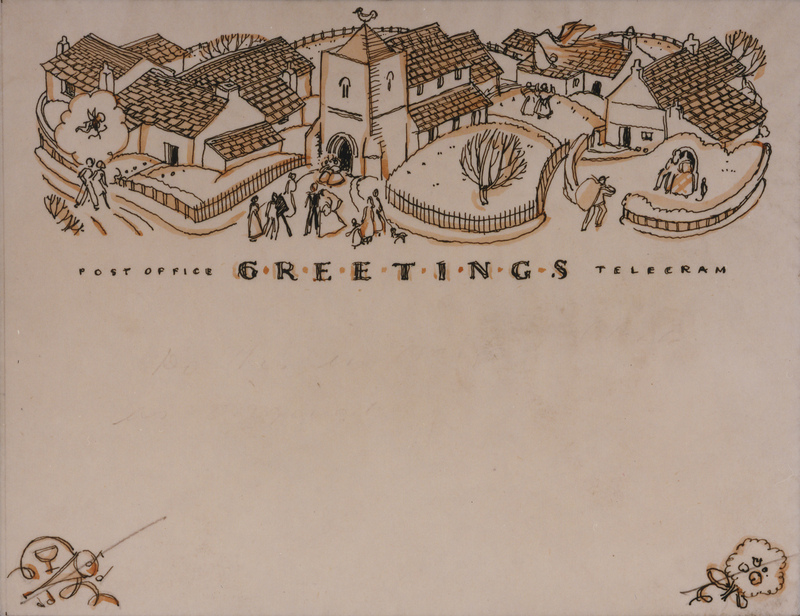 To celebrate we’re offering free shipping on a beautifully illustrated book of telegrams, which Abi gives us a sneak peak of in today’s blog. 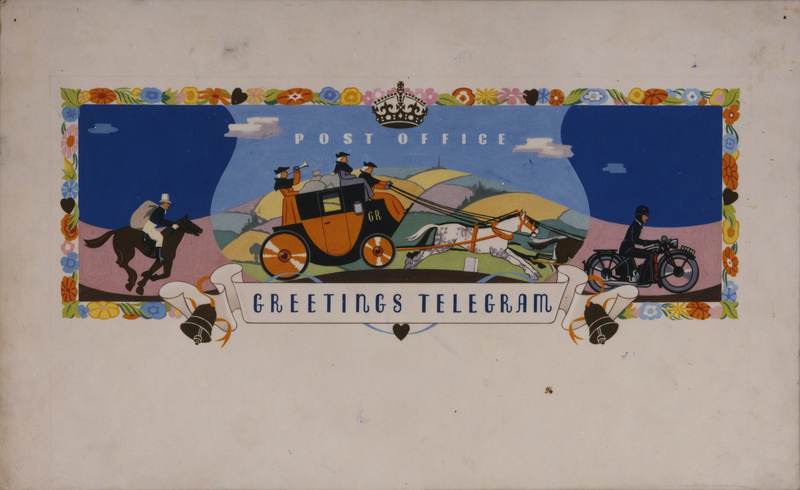 This month marks the 80th anniversary of the introduction of Greetings Telegrams, and having been quite taken with their striking designs I thought it was rather appropriate to read into their history. Ruth Artmonsky’s book, ‘Bringers of Good Tidings’, very eye-catching in itself, combines beautiful examples of Greetings Telegrams with stories of their controversial history, which really gave me an insight into why they became so popular. Artwork for a poster. Subject: Greetings Telegram service. Artist: Henrion, Frederic Henri Kay. Media: Not known. 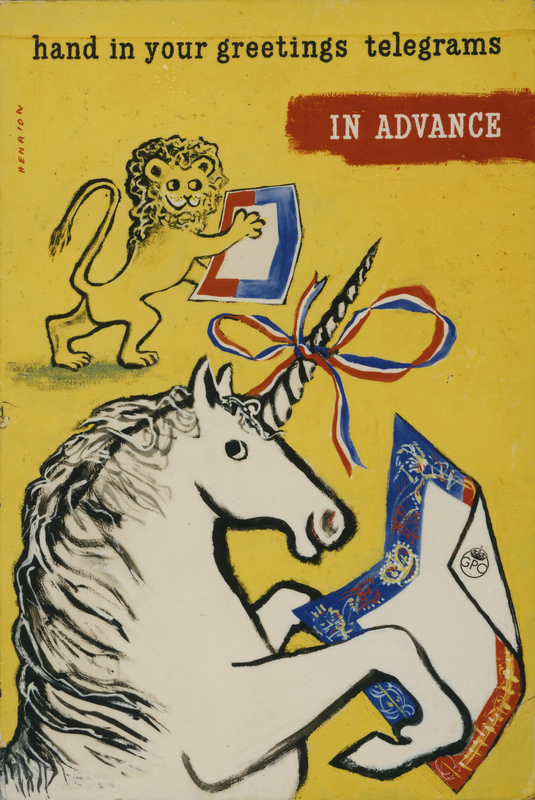 Within the book we are introduced not only to the background of these, at the time revolutionary, telegrams, but also to the people behind them, including their champions, designers and the ‘Telegram Messenger Boy’. Whilst reading I also came to understand the need that was felt to dispel the negativity attached to receiving telegrams, which had gained a reputation as bringers of bad news during the First World War. 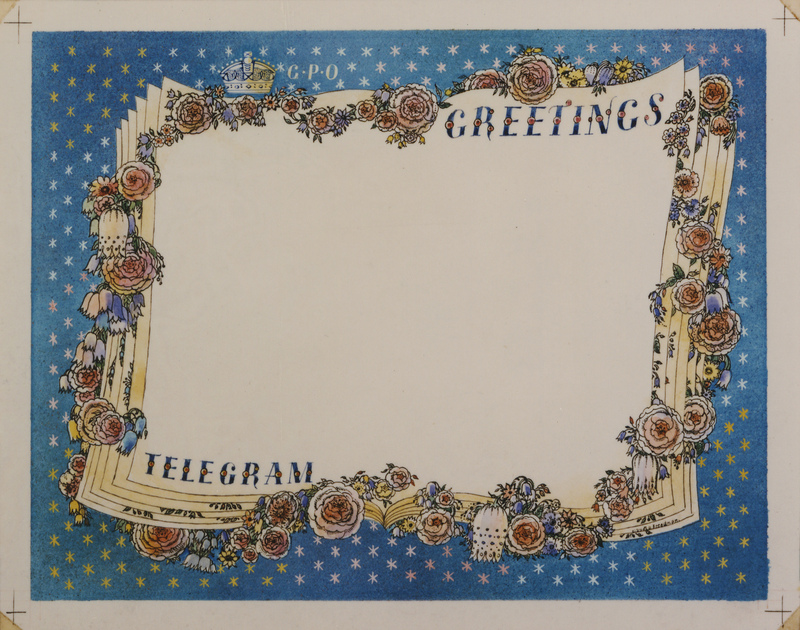 I have to say that these decorated telegrams could not be mistaken for being anything other than positive, a lot of them were altogether too brightly coloured! 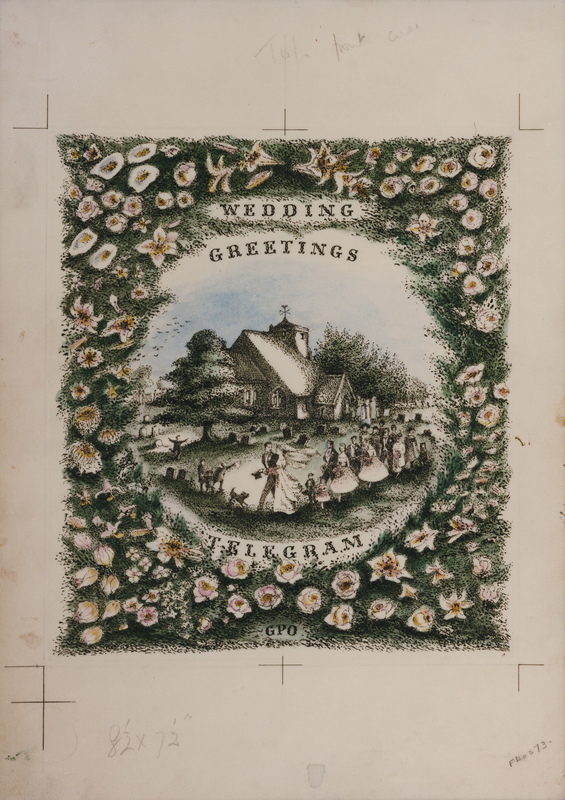 Featuring a floral border and a wedding scene. Artist: Corsellis, Elizabeth. Media: Watercolour, ink, board, poster paint. Flicking back through the copy of the book in front of me I’m struck by how special it would be to receive one of the beautiful messages in their gold envelopes, a feeling that birthday texts just don’t create, however well-meaning they are. Perhaps I need to put a little extra effort into my Christmas cards this year! Featuring a border with roses and stars. Artist: Freedman, Claudia. Media: Watercolour, ink, paper. Get free delivery on ‘Bringer of Good Tidings: Greetings Telegrams 1935-1982’ when you enter code TELEGRAM80 at the checkout. Featuring a village wedding scene. Artist: Atkins, Kathleen. Media: Watercolour, ink, paper. As countries around the world commemorate the 70th anniversary of D-Day (the allied invasion of Nazi-occupied Europe on 6 June 1944) news channels fill our screens with moving and horrifying images and footage of troops readying themselves on the shores of southern England, planes on bombing runs across the channel and landing craft coming ashore on the beaches of Normandy. The films show the military hardware, the explosions and exchanges of gun fire, and the people on the front line of the successful offensive. But what they do not show is the immaculate and comprehensive pre-planning that went into that crucial day, seen as the point in which the war turned in the favour of the Allies. Number of bags of mail sent on D-Day and the following days from Army Council Secretariat minutes dated 19 June 1944 (POST 47/770). One of the organisations involved in that planning was the General Post Office. Its work both in the lead up to, and aftermath of, D-Day was of major importance. Flicking through our files, it’s amazing what we uncover. Alongside some interesting information detailing the GPO’s activity both before and after D-Day itself in POST 47/770, we also unearthed a letter printed in the Post Office Circular of Wednesday 28 June, 1944. 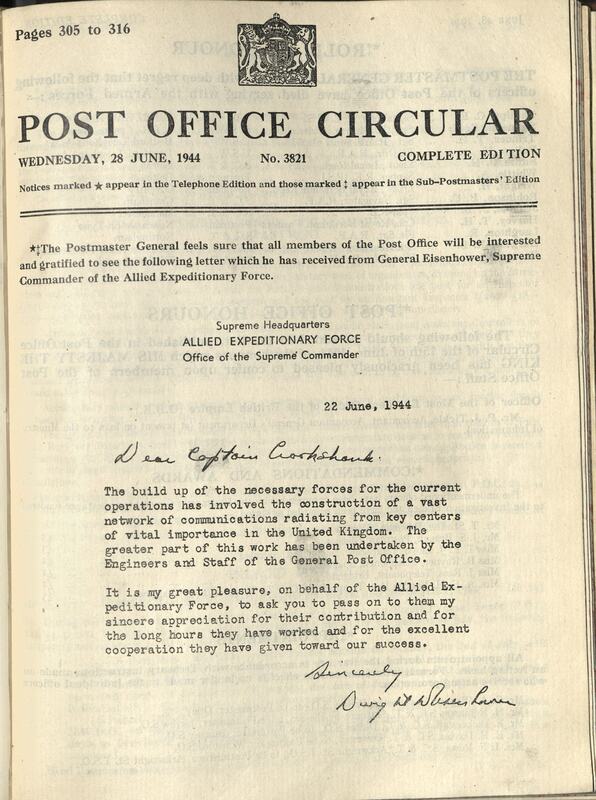 The letter, dated 22 June 1944, thanks the GPO for its work in constructing “…a vast network of communications radiating from key centers of vital importance in the United Kingdom” and makes a point of offering the author’s appreciation of “their contribution… and [for the] excellent cooperation they have given towards our success”. Not only does this give us an insight into the vital role the GPO played in D-Day itself, but it shows how important the contribution was deemed at the time. Perhaps most excitingly, the letter is signed by Dwight D. Eisenhower, Supreme Allied Commander. The build up of the necessary forces for the current operations has involved the construction of a vast network of communications radiating from key centers of vital importance in the United Kingdom. The greater part of this work has been undertaken by the Engineers and Staff of the General Post Office. It is my great pleasure, on behalf of the Allied Expeditionary Force, to ask you to pass on to them my sincere appreciation for their contribution and for the long hours they have worked and for the excellent cooperation they have given toward our success. In this post, we asked Curator Emma Harper to talk about her favourite object. You will be surprised about what she came up with! Asking a Curator to pick their favourite object is a bit like asking a child what they’d like to be when they grow up, in most cases the answer will change from day to day! 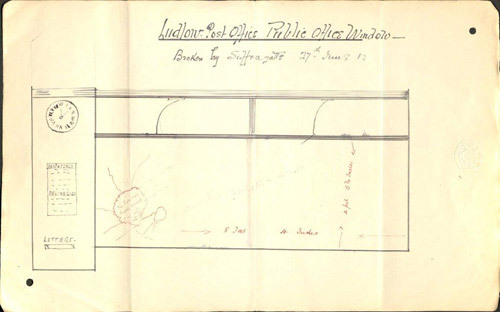 Should I choose the earliest letter box in our collection used in trials on the Channel Islands; the pneumatic rail car that was used to test the idea of using an underground railway to move the mail; or perhaps our recent acquisition of the diary of Post Office Rifleman, Thomas May, written when he was fighting in France in 1915. All of these are fascinating objects which help to illustrate the many interesting stories that our collection can tell. Instead however, I have chosen a truncheon. Now this may seem a lot less interesting than the items I’ve listed above but it is often the unassuming, apparently ‘boring’ items that can surprise us and this item, in my opinion, does just that. 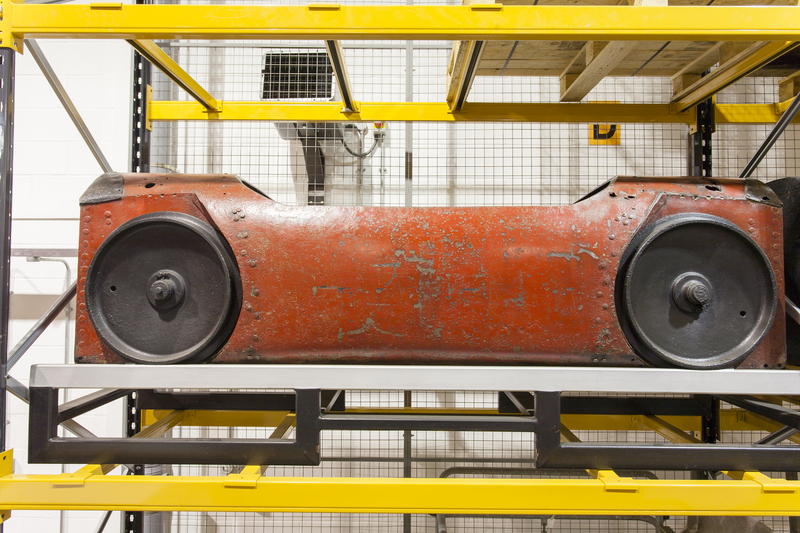 A runner-up for Emma’s favourite object: 19th century pneumatic rail car. 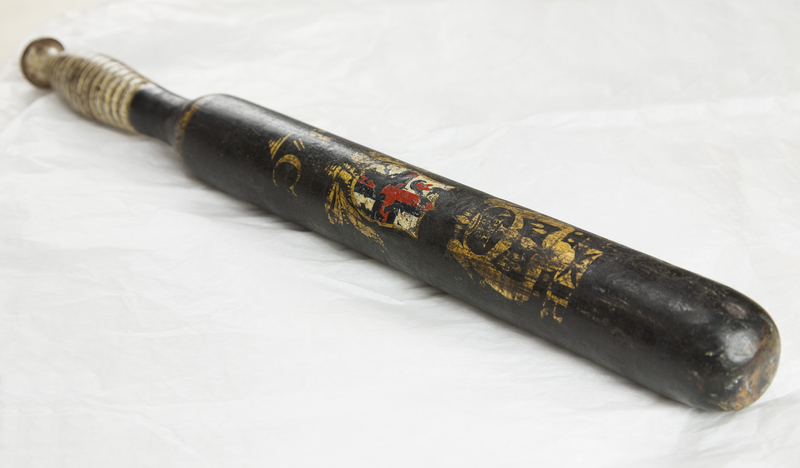 It is a fairly plain wooden truncheon with the handle painted white and the rest painted black. If you look closer however it not only has ‘GPO’ [General Post Office] inscribed on the back but also bears the coat of arms of the City of London, Queen Victoria’s cipher and a date ‘10/ APRIL/ 1848’. 1848 has become known as a year of revolutions and this particular date in April was the date of the Chartist’s mass demonstration on Kennington Common and procession to present their third National Petition to Parliament. The Chartist movement was named after the People’s Charter which demanded political and electoral reform and in particular called for all males over the age of 21. William Edward Kilburn – View of the Great Chartist Meeting on Kennington Common. 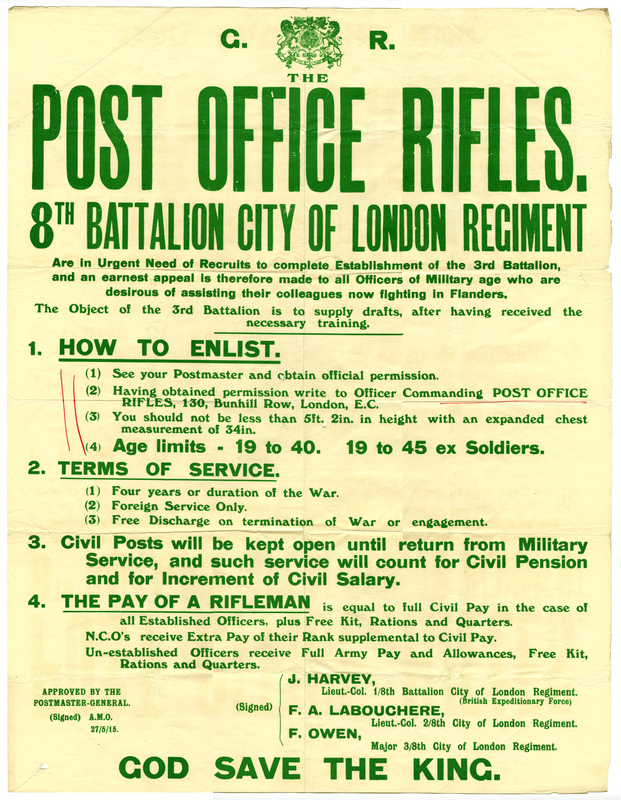 It was feared by the government that the Kennington Common rally would spark revolution not just in London but across the country and that government organisations such as the General Post Office could well be targeted. As the Illustrated London News stated on 15 April 1848: ‘the speeches of those gentlemen [the Chartists] had led the public to anticipate some serious disturbance of the peace of the metropolis, the Government and the civil authorities had made some extensive and well-arranged preparations to suppress effectually any violation of order or tranquility, should such be attempted.’ As a result, the government issued GPO staff with truncheons, including the one now in our collection, in order to protect themselves and Post Office property. In the end the day passed off with relatively few violent outbreaks and, as far as I know, no direct attempts on the GPO. While it may never have seen action, I hope I have shown how even the plainest of objects can add to our knowledge and understanding of history and our collection. 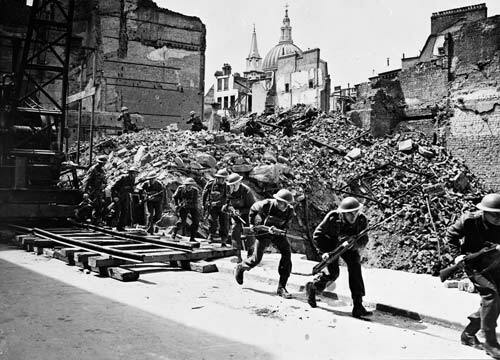 While the full force of the Blitz was focused on London, British ports, industrial towns and cities and other key strategic places throughout the country were also in the firing line throughout 1940 and 1941. One of the major targets was Dover, as attested by a document held at the British Postal Museum and Archive. 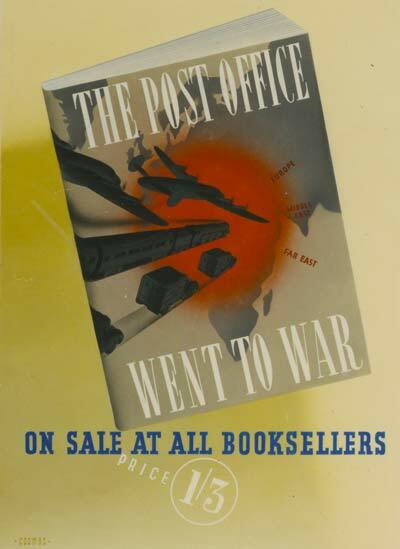 Entitled ‘Dover Post Office and its Staff in War-Time’, the typed account begins in June 1940, shortly after its author – Arthur William Bradshaw Mowbray – became Head Postmaster of the town. Owing to its proximity to the continent, Dover was of course an important link between Britain and France but, as Mowbray wrote, ‘Later we wished the Straits were not so narrow’. Upon the start of the Battle of Britain, Dover became the front line, suffering almost daily air battles above it and frequent bombing of ships in the harbour. Streams of machine gun bullets and flying shrapnel from anti-aircraft guns regularly made the streets unsafe. The Post Office counter had to be closed at times, with extended opening hours arranged when it was possible for the public to visit safely. 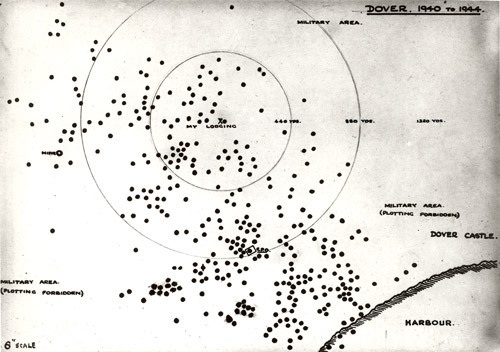 As well as aerial bombardment, Dover was also subject to long-range shelling with over 1,700 incendiary shells falling on the town between June to December 1940. By the end of 1941, the siren had sounded 1,599 times in the town since Mowbray had started his account. He proudly notes that in 1941 the Telephone Exchange was abandoned only four times. Council House Street Sub Post Office was partly demolished by shellfire in November 1940 and in 1941 a large bomb exploded 20 yards away. Yet the Sub Postmaster opened his office door punctually the next morning. After a third raid with delayed-action bombs, he was persuaded to leave the district with all other residents. Another office near the docks was so badly damaged that one could stand in the Sub Postmaster’s bedroom and see through both of his neighbour’s houses. The Sub Postmaster was found – dishevelled, covered in lime dust and cobwebs with his cat, which had been buried under debris for several hours. It was thought unnecessary to close the office. 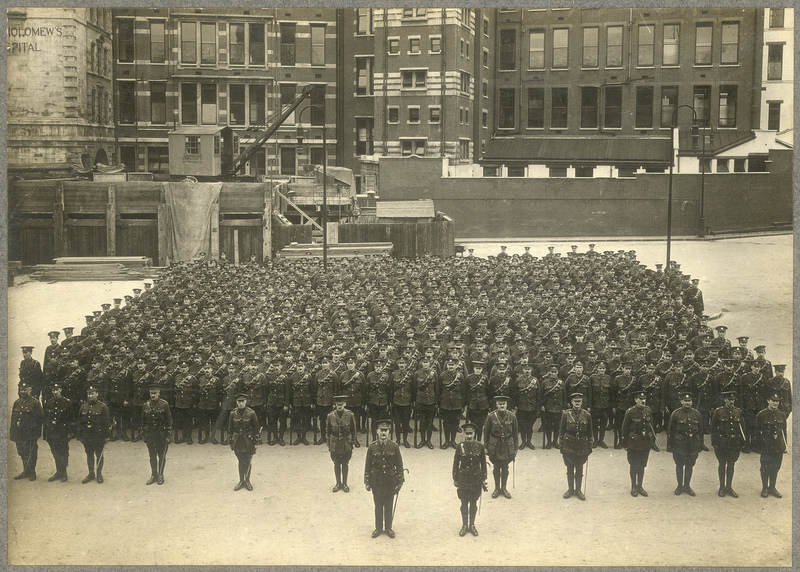 In May 1941, the Garage and Mail entrance of Dover Post Office was shelled – the Sorting Office that adjoined had its numerous gaps in the roof ingeniously blocked, allowing work to be resumed and all collections and dispatches to be made to schedule. In other raids, this same Sorting Office was flooded due to broken pipes, and had an incendiary lodged in the roof slates. 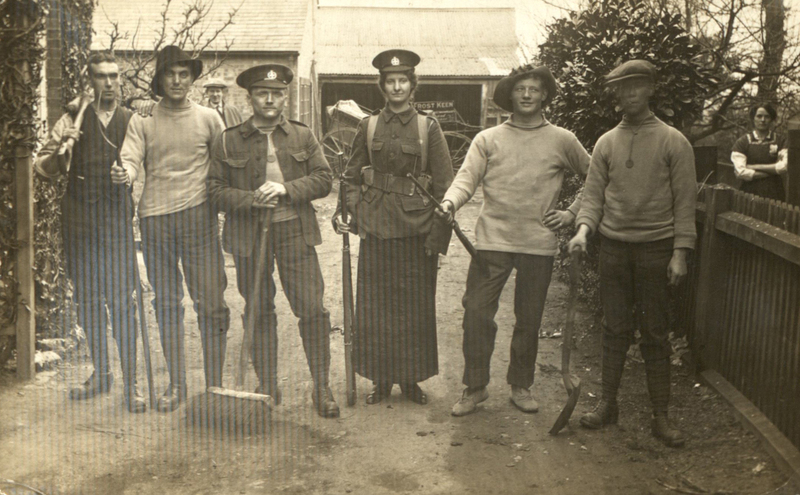 ….our good fortune in escaping wholesale destruction or injury [which] does not detract from my admiration of the high morale of the Staff which enabled them to carry on under continuous hazards at a time when the majority of our Island people were still only reading of the war in the newspapers. Sadly that luck was to run out, as later in the war a number of GPO staff in Dover did become casualties. There will be more from the AWB Mowbray accounts in future blog posts. On 27 June 1912 Miss Jane Short, an art student from Letchworth, broke 11 of the small leaded lights of the front office windows at Hitchin Post Office with a hammer and several stones. Mr Tully, the office’s overseer, found the woman outside being held by a man named Russell, who had taken the hammer from her. The Police then came to take Miss Short to the police station. Miss Short gave an assurance that she would commit no more damage, but stated that she desired to be locked up. At the insistence of the Postmaster, Mr Gadd, she was not locked up but seen home to Letchworth by a police constable. Miss Short had previously broken the windows at Baldock Post Office for which she was committed for trial. The prisoner appeared in the dock stylishly dressed in a blouse, skirt and hat, and appeared to be a young lady of superior education of about 20 years of age. She had a pleasant face and somewhat gentle bearing. The pleasant-faced lady in question gave her name as Elsie Rachel Helsby of Shrewsbury, but there was some question over her identity as she had given the name Miss Holmes of Hampstead at a local hotel. She was granted bail but refused it, and she was remanded in Shrewsbury Prison. A subsequent newspaper report details that Miss Helsby smashed the windows with a hammer to which was attached two labels, one reading “Votes for Women”, the other a protest against the force-feeding of suffrage campaigners on hunger strike. In her defence at the trial Miss Helsby stated that she had been motivated to break the windows because of the treatment of women at Holloway and other prisons, and “in defence of poorly paid women and unhealthy and over-worked children”. She saw the hammer as her only weapon in this fight. The magistrates decided that Miss Helsby could either be fined for costs and damages or sentenced to 28 days hard labour. Miss Helsby elected for the hard labour and was sent back to Shrewsbury prison. Also detailed in the file is correspondence concerning who should cover the damages. Ludlow was a sub-post office and its premises were leased by the sub-postmaster. The landlord of the premises, Mr Chubb, was liable for the damages to the window but refused to pay arguing that it had been an institution of government (the General Post Office) which had been attacked in this instance. This argument was eventually accepted by the GPO. In the early 20th Century the state-owned GPO was one of the largest businesses and employers in the world. It controlled the mail, telegraph and telephone services throughout the United Kingdom, and was vital to everyday life. With a post office branch a feature of almost every high street in the country it was one of the most visible signs of government and authority, and was thus an ideal target for suffrage campaigners. The First World War interrupted the suffrage campaign, and it would not be until 1928 that women in the United Kingdom had the same voting rights as men.